This scenic blank card has a photo of the Rose Garden at Nymans in Handcross, West Sussex. It is home to a huge variety of roses - old fashioned varieties and modern shrubs, English roses and ramblers. 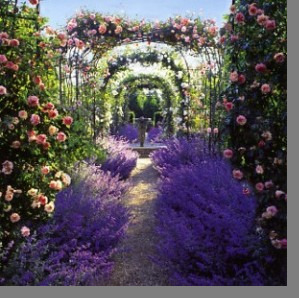 This photo shows a path lined with catmint, covered by an arbur of roses. Nymans was one of the first gardens to be cared for by the National Trust back in 1953. Its beauty is the achievement of 3 generations of the Messel Family over a span of 100 years.